This photo was taken by Clarence, from Streetfilms.org, whilst he was in town for the Velo-City conference. 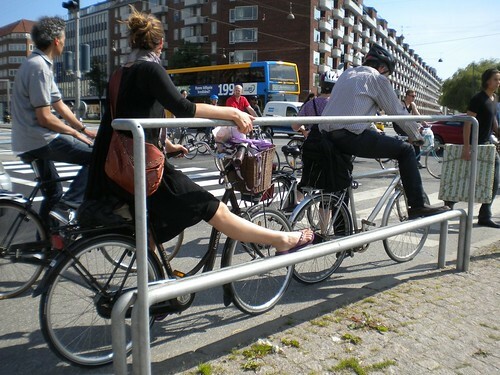 I ride past this cyclist railing/footrest almost every day and there is always a Copenhagener or two holding onto the railing or resting with their foot on the footrest. Riding around on bicycle tours of the city, this is stop on the route where I also talk about the intersection and infrastructural improvements for cyclists. It never fails that a Copenhagener rolls up and uses the railing/footrest while I'm standing there with guests.